It’s that time of year when we ‘remember, remember the fifth of November‘ and if you’re looking for Hertfordshire firework displays near you in 2018, then here’s a bumper list of spectacular displays for you to check out. This year Welwyn Garden City Football & Social Club are hosting a ticket-only Traditional Fireworks Display! Enjoy the firework display on Friday 2nd November 2018, gates open at 6pm. This is a ticket only event, no cash entry on the night. There will also be fairground rides, street food stalls and an outdoor bar. Visit the website to purchase your tickets or for more information. Abbots Langley Fireworks Display will take place on Friday 2nd November 2018. Gates open at 6.30pm. There is no entrance fee but a collection is taken to help pay for the firework display and any profits go to the Watford Lions Club nominated charities. Visit the website for more information. Camelot Fireworks Night will take place on Saturday 3rd November 2018, gates open at 5pm. Advance tickets are available from Hemel Hempstead RUFC behind the bar. A fun night out for all the family! Visit the Facebook Page for more information. 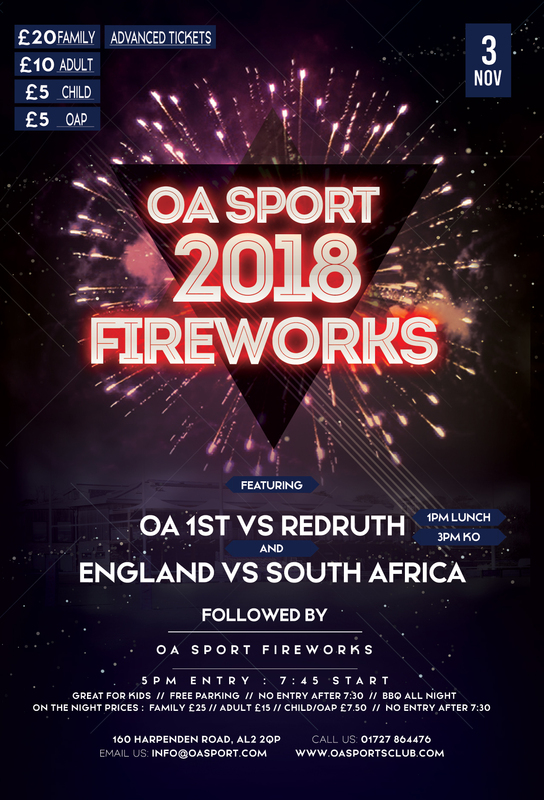 The OA Sport 2018 Fireworks will take place on Saturday 3rd November 2018. Gates open at 5pm and close at 7.30pm. The display is scheduled to take place at 7.45pm. A BBQ will be available on the night. Visit the website for more information or call 01727 864476 to book your tickets. Visit Cassiobury Park on Saturday 3rd November 2018 for a night of fireworks and fun organised by Watford Borough Council with support from Vibe 107.6FM. Entertainment starts at 6pm and there will be a fabulous firework display expected to take place at 7.30pm.There will also be a variety of food and drink outlets, children’s fun fair rides and bungee trampolines. Visit the website for more information on parking. Enjoy the Berkhamsted Rotary Fireworks on Saturday 3rd November 2018, gates open at 6pm and the firework display is scheduled to start at 7pm. The 30 minute all-weather professional display is put on by Classic Fireworks and is linked to music, lighting and lasers to create a fantastic show. There will be stalls, children’s attractions, a barbecue and a bar so come early and enjoy the fun. Advance tickets will be available to purchase from the ticket stall on Berkhamsted Market on Saturday 3rd November 9am-1pm, or online. Visit the website to book tickets or for more information. The annual Redbourn Fireworks On The Common will be held on Saturday 3rd November 2018 on Redbourn Common at 7pm. There will be a fun fair and the Scouts will be selling hot dogs and burgers. Visit the website for more information. The annual Ware Fireworks Display takes place on Saturday 3rd November 2018. Gates open at 5.30pm and the fireworks display is expected to take place at 7pm. Visit the website to book tickets or for more information. Hatfield Town Council’s spectacular firework display returns on Saturday 3rd November 2018. Gates open at 4.30pm. New this year, children’s fireworks are scheduled to start at 6.30pm, with a short break and then Family Fireworks are scheduled to start at 7pm. Free parking and bus travel to the fireworks is available at The Forum, University of Hertfordshire, Hatfield, AL10 9AB. Visit the website to book tickets or for more information. On Sunday 4th November 2018, Harpenden Rugby Club host their annual fireworks extravaganza. Gates open at 4pm and the display is scheduled to start at 6pm. Fireworks, bonfire, fun fair, food and bar. Parking is limited so please make use of the courtesy bus which will run from Church Green in Harpenden from 4pm onwards. Tickets are available direct from the Clubhouse on Redbourn Lane, The Enchanted Tea Rooms in Redbourn, as well as The Silver Cup and Strutt & Parker in Harpenden. Visit the website for more information. The Hitchin Fireworks Display takes place on Sunday 4th November 2018. Gates open at 4pm. Fireworks, bonfire, food and refreshments. Advance tickets are available from a number of locations in Hitchin and Codicote. Visit the website for more information. The Wheathampstead Fireworks Display takes place on Sunday 4th November 2018. Gates open at 5pm and the fireworks display is scheduled to begin at 5.45pm at Beech Hyde Primary School, Nurseries Road, Wheathampstead, Hertfordshire, AL4 8TP. There will be a BBQ, hot and cold drinks and glow toys all available on the night. Get your tickets for the family friendly firework displays from Beech Hyde Primary School Office, Wheathampstead Pharmacy, Wheathampstead Post Office and Wheathampstead Tesco. Visit the Facebook Page for the latest information. The Jersey Farm Fireworks Display returns as a ticket-only fireworks display on Sunday 4th November 2018. This is a ticket only event, no cash entry on the night. Tickets will be available from St Brelades Place, St Albans on 27th and 28th October 2018 and 3rd and 4th November 2018 (subject to availability). There will be a BBQ and music. Visit the Facebook Page for more information. The Morgans School Professional Firework Display takes place on Friday 9th November 2018, gates open 6.30pm, fireworks are expected to take place at 7.30pm but front entrance only open until 7.15pm.Tickets are available from Hertford Tourist Information, 10-12 The Wash, Hertford or by calling 01992 584322. Visit the Facebook page for the latest information.